Do you regularly run workshop sessions with people who have not met each other before? Are many of these sessions one-offs? 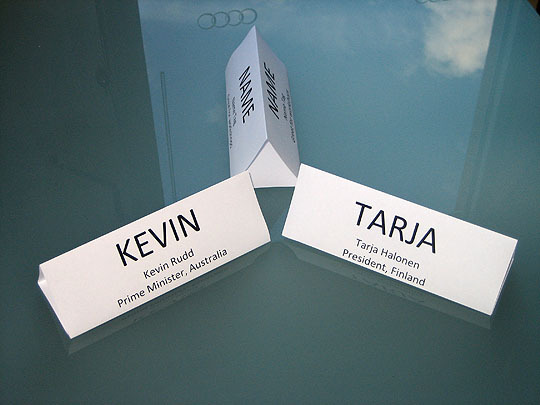 We have found it very useful to produce simple name plates for workshop participants, facilitators and stakeholders. They help everyone know who’s who and make discussion easier. Select the contents of the second cell (not the whole cell) and copy, then select contents of the third cell and paste to replace. This retains correct cell orientation. Fold printed sheet in half twice, then fold the fourth quarter back to form a triangle. Repeat steps 2 to 5 for each attendee. Too easy! 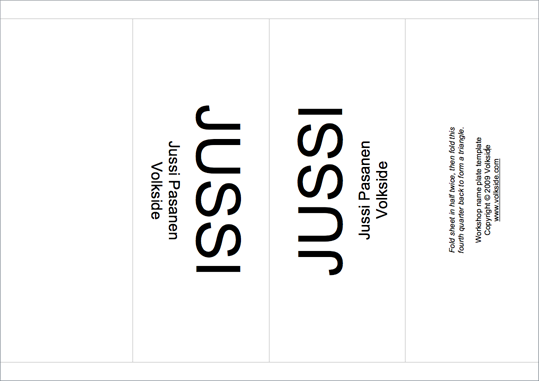 Download workshop name plate template as an RTF document (24 KB, paper size A4). You can open and edit it in your favourite word processing application such as Microsoft Word. If you find this template useful and use it in your workshops, please leave a comment below. Thanks! Very nifty. So simple, and yet so useful. Thanks Jussi. Very useful, thank you it helps a lot!!! Please help me i need to insert a logo??? if you’re using Microsoft Word you should be able to insert a logo easily as an image. Select Insert > Picture > From File… in the menu, or use buttons in the ribbon if you’re using Word 2007. Just make sure you scale it small enough so that table cell widths stay the same, or change Image > Layout > Wrapping style to show the image in front of text. The only problem is you’ll probably need two versions of the logo, one rotated 90 degrees clockwise and another one rotated counterclockwise. You can do this in Microsoft Paint, for example. If you use the same logo for all participants it should be easy enough but probably more trouble than it’s worth if everyone comes from a different company. Thank you very much..why did i not know about you earlier!!! Previous Previous post: What is usability and why should I care?